Provided by the publisher for the Cybils nonfiction picture books award panel. This book of striking (sometimes literally) photographs of one of the world's scariest species was a finalist for the 2012 the CYBILS Nonfiction Picture Book Award. 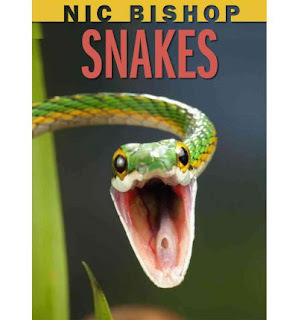 Nic Bishop, who also has similar concept books about lizards and frogs and spiders (Sibert Honor boo) shows off over 20 kinds of snakes in a range of actions, from hanging on a tree branch, keeping warm in freezing Manitoba by sticking together in a crowd, to devouring their prey. The best thing is Bishop seems to anticipate kids' questions and answers them almost as soon as my kids have asked them. "You might think that snakes would get stomachaches eating such big meals. But they have special ways to deal with giant portions." The book is a little graphic with the eating, which might make more sensitive kids a little queasy, but my kids love the pictures of a couple of snakes partaking in their meals. The book is above my son's (6) reading level, but this works great as a read aloud. One of the best things about the book is how Bishop points out the size of the actual animal in relation to the picture. This provides a great and fun math lesson! This will appeal to kids who love sharks and other predators. This review is for Nonfiction Monday, hosted this week by Wendie's Wandering. I'm surprised by how much my second graders like these photographs of eating. I want to see the photo of the snakes in Manitoba. I adore Nic Bishop and I don't have this one yet! He wasn't the author, but check out Chameleon, Chameleon if you haven't already. He was the photographer. It is a lower reading level, so your son may be able to read it independently. I haven't read any of Nic Bishop's books as yet - this one looks pretty creepy, but I'm sure the visuals are arresting and would prompt the kids to read through the text. Thanks for sharing this. Looks like a book my 12 year old son would enjoy! I'll have to check and see if it's been translated into French! I am a big fan of Nic Bishop's photography and books. I haven't seen this one yet though. I will look for it. Thanks for your comment at All About the Books with Janet Squires. I'm glad you found my post interesting.